Enabling the use of tungsten-balanced film under daylight conditions, this 72mm 85 Color Conversion Filter from Formatt-Hitech is a warming filter used to decrease the color temperature from 5500K to 3400K. The amber color of the filter has a filter factor of 1.5x, requiring an additional 0.6 stops of exposure to achieve normal results. This filter is constructed from Schott glass to maintain high image clarity and color fidelity, and it features a lightweight yet durable aluminum filter ring with 72mm front threads. 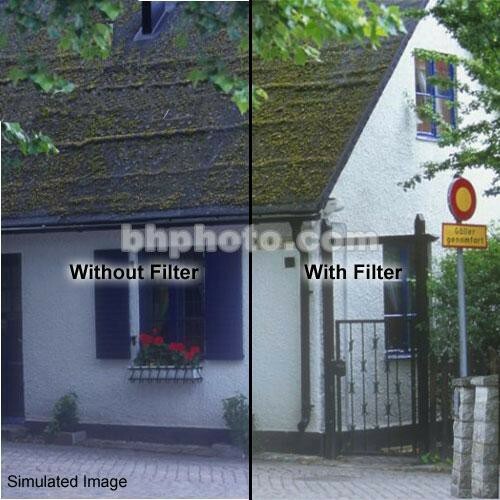 Amber color conversion filter decreases color temperature and provides a warming effect. Converts 5500K to 3400K for using tungsten-balanced film under daylight conditions. Filter factor of 1.5x requires approximately 0.6 stops of additional exposure to maintain normal results. Aluminum filter ring is both lightweight and durable.